A few proposed gas pipeline projects have led to a hot debate over the future of the Nature Reserve. All is fair in love and war—but what about protected natural resources and industrial gains? The Pinelands have long been the center of many environmental oppositions—today more than ever with the proposal of natural gas pipelines including the South Jersey Gas (SJG) Cape Atlantic Reliability Project, which has become an ongoing saga spurring tensions through our area and a discrepancy between constituents and their representatives. Ever since its proposal in 2012, the project has been shrouded in political turmoil, protests and court appeals. While its first proposal was turned down by the New Jersey Pinelands Commission, they approved the latest iteration in February 2017, a decision that was kicked back to the Superior Court of New Jersey following legal challenge by various environmental groups. W hile both sides are awaiting the court’s ruling, the Pinelands remain untouched, a haunting calmness before a potential firestorm that could ignite further opposition. During this waiting period, South Jersey Magazine spoke to both its supporters and opponents about their stance and if this approval opens the door to additional construction within the protected Pinelands. 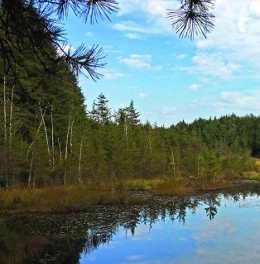 Deep within South Jersey, there are approximately 1.1 million acres that make up the Pinelands National Reserve (PNR)—otherwise known as our nation’s first National Reserve. It occupies 22 percent of our state’s land area, reaching parts of seven counties and is considered the largest body of open space on the Mid-Atlantic seaboard between Richmond and Boston, according to the Pinelands Commission. Nestled there, is the KirkwoodCohansey water-table aquifer, accounting for an estimated 17 trillion gallons of groundwater, the historic Batsto Village and Wharton State Forest, to name a few. It’s also home to native plants and species—including the Pine Barren Gentian, Thread-leaved Sundew and the Northern Pine Snake—and is known as a world biosphere and UNESCO site. As a means of protecting this National Reserve, the Pinelands Comprehensive Management Plan was implemented, with the Pinelands Commission seeing that its rules and land-use guides are followed to both protect the Pinelands’ ecology, while also granting compatible development. This authority was granted following the National Parks and Recreation Act of 1978 and the New Jersey Pinelands Protection Act in 1979. In the eyes of the supporters, that compatible development includes the Cape Atlantic Reliability Project, a 22mile natural gas pipeline that would run through Atlantic, Cape May and Cumberland counties ending at the B.L. England power plant located at Beesleys Point in Upper Township, Cape May County. There, it would “facilitate the conversion of the facility from coal to natural gas,” according to SJG general manager, public affairs Dan Sperrazza. This transition from a coal- and oilfired electric generator to a natural gasgenerator would, in turn, make it one of the cleanest power plants in New Jersey, as it would emit lower emissions compared to existing power plants on the grid. It would also enhance the area’s access to safe, reliable energy, cleaner air and cost-effective, locally sourced electricity generation, as noted by Sperrazza. The promise of cleaner energy has struck a chord with local leaders, including Vicki Clark, president of the Cape May County Chamber of Commerce, who says the conversion of the plant would be “tremendous” to the local environment. Furthermore, the pipeline would also generate enough energy to power about 480,000 New Jersey homes and would also provide a backup natural gas supply to its customers in Atlantic and Cape May counties—currently about 142,000— and more than 28,000 in the Pinelands in the event of an accident or natural disaster—much like Superstorm Sandy. Supported by leaders including Clark, she notes, “I am confident with the route of the pipeline, and it will be installed basically underneath areas that are paved with roadways. Nothing I have seen causes any alarm for the disturbance of the Pinelands or any other pristine areas. While the Comprehensive Management Plan was instituted to protect the natural state of the Pinelands, some argue it has become a loophole to approve new non-compatible development, like that of Cape Atlantic Reliability Project. In fact, environmental groups, such as Sierra Club, believe the commission was wrong to approve the proposal as it violates that very plan. “The plan says that when you’re talking about infrastructure like a gas pipeline, it has to primarily serve the needs of the people in the Pinelands,” explains Tittel. “The problem is that the pipeline starts outside of the Pinelands, goes through the Pinelands and ends at a power plant to produce electricity, where that electricity is going to go anywhere and does not primarily serve the needs of the Pinelands. That opposition is just the tip of the iceberg as the Pinelands Preservation Alliance says the project would run through a conservation zone of the Pinelands, where this type of infrastructure is simply not permitted. “The roads along which South Jersey Gas proposes to build the pipeline run through both residential and forested areas, including public nature preserves,” argues Executive Director Carleton Montgomery. Clean Water Action New Jersey also argues the pipeline will threaten the Kirkwood-Cohansey aquifer, which supplies drinking water to Southern New Jersey. “The pipeline will lie in the aquifer throughout all or most of its length,” explains Montgomery, as supported by a 2017 HydroQuest report. While supporters also believe the pipeline would provide both clean energy and jobs, opp onents including Sierra Club believe safer energy alternatives would also promise long-term jobs—without harming the Pinelands. In light of Gov. Phil Murphy signing an executive order to move the state toward a goal of 3,500 megawatts of offshore wind energy generation by 2030, Tittel believes offshore winds is the best alternative. “The state has been devastated by climate change [and] having more plants that emit greenhouse gases and fueled by fossil fuel makes no sense when we can [do] more [with] renewable energy. “We would create plenty of jobs in the manufacturing and construction of those windmills—especially the maritime industry—and maintaining them,” rebukes Tittel. “Also, the redevelopment of the B.L. England site … could become a resort [instead of] being a big smoke stack … and that would create jobs, too. Starting in Medford Lakes, which is also located within the Pinelands, borough manager Robert J. Burton explains that while the community embraces its protection, they have not received much feedback about the pipeline—most likely due to the fact that the location is a good distance away. In Tabernacle, residents are served by a mix of natural gas and oil heat, and while residents have submitted requests to SJG for service, the company has been unable to do so per infrastructure limitations. “Tabernacle felt it was necessary to express our high interest in this project because if basic infrastructure—regardless of direct impact—is not able to be constructed, what does that mean for our residents and their future options for affordable natural gas?” asks deputy mayor Stephen V. Lee IV. As both sides await the court’s ruling, it’s worth asking: What does it mean for the future and does it set the precedent for the industrialization of the Pinelands? Looking at New Jersey as a whole, there’s also the New Jersey Natural Gas Southern Reliability Link, a 30-mile natural gas pipeline planning to run through Burlington, Monmouth and Ocean counties. In Central Jersey, there’s the proposed PennEast pipeline that would cross the Delaware Wild and Scenic River, in addition to more than 3,000 acres of preserved lands. Out in North Jersey, there’s the proposed Pilgrim Pipeline, which would cut through the Highlands, several major drinking water sources and the Great Swamp National Wildlife Refuge. What’s more, President Donald Trump has also proposed oil drilling along the Jersey Shore and the rest of the Atlantic coast. Some could say this moment in Pinelands history is reminiscent of the late 1950s, when the idea of a Pinelands jetport was considered. While it was defeated in 1969 thanks to Gov. William T. Cahill, the controversy stands as an eerie reminder of what could have been. While the Pinelands Commission has been unable to comment on the matter since it’s currently in litigation, both sides are preparing for a resolution. A resolution that may be in favor of protecting the Pinelands or of providing its inhabitants with a clean, reliable energy service. Perhaps there can be a resolution that caters to both sides, wishful thinking even as Gov. Murphy’s new administration takes the reins. Either way, it’s clear supporters and opponents want to create the best possible option that will benefit both the Pines and its residents—but at what cost?